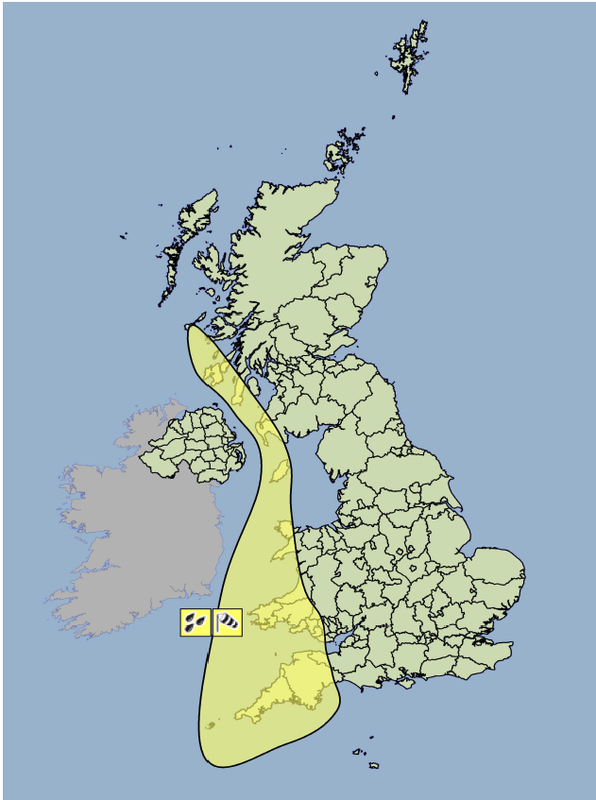 Today for the first time we have issued a new dual National Severe Weather Warning for wind and rain. What is a Dual Warning? A dual warning is one warning, covering one geographical area, over one period of time in the way a single warning does – but it combines two different types of severe weather. They would only be combined if they were both at the same warning level. Any of the five types of weather warnings, Wind, Rain, Snow, Ice and Fog, can form a dual warning in any combination. So in theory Wind and Snow could be a dual warning. In practice there are certain weather types that are more likely to form a dual warning; the most likely is Wind and Rain, which is what we see today. More information on our dual warnings can be found at the bottom of our Weather Warning page. These new dual warnings have been developed following extensive two-way conversations with emergency responders and feedback we have recieved from the public over the past twelve months. Until now, we would have issued multiple severe weather warnings to cover the range of warnings in place. Quite often however, situations arise where multiple impacts occur and these can now be shown on one map. This should make the information we issue easier to access. The warning for wind and rain issued today covers Southwest England, Western Scotland and the Irish Sea between 07.00 and 23.45 on Thursday 13 November. A small area of low pressure will move quickly northwards throughout the day bringing a short-lived period of gales and severe gales and spells of heavy rain. We encourage everyone to keep up to date with the latest forecasts and national severe weather warnings and to stay weather aware this winter by following the Met Office on Twitter, Facebook, Google+ and YouTube for the latest weather information. You can also sign up for severe weather alerts from us through the Twitter Alerts programme, providing critical information directly to your phone. Find out more about how to sign up for Met Office Twitter alerts. This entry was posted in Met Office News and tagged dual warning, heavy rain, Met Office, National Severe Weather Warning Service, rain, severe weather, weather warning, wet, wind. Bookmark the permalink. And tomorrow in Metanory we will be telling the children how a knife and a fork are called “Cutlery”, which some very small children might think is only one thing. But they would be wrong, because Cutlery is when you have both a knife and a fork and sometimes even a spoon. That doesn’t mean they are all the same thing, because that is a “knispork”. No, cutlery means that we are talking about all different kind of things but in a grown up way. A much better warning system. The old wind and rain system was difficult to work out at the best of times.